I got to pick a free set after my DH won the Mr. Stamper challenge and he helped me choose Xmas Birds. I just got it in the mail today (thanks so much Marie!!) and thought it was perfect for the latest Pink Poison sketch. I stamped the banner in Pearlescent Sky Blue Brilliance ink so it has a nice shimmer IRL. I glued on tiny little rhinestones that also add a nice bit of sparkle. 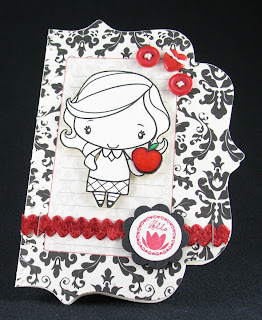 I stamped the ribbon in black Brilliance ink on red cardstock, coloring portions with Copics for shading. I then cut out the whole thing, cutting off the tails so that I could reposition them to open up the bow a little more (if I had left the bow as is, the tails would have blocked the corner of the banner image). I added some buttons tied with silver cording, ribbon and lace to finish it off. Oh, and also some patterned paper from Basic Grey. TFL! For today's card, I decided to use a sketch from Our Creative Corner. I haven't had a chance to use this Mermaid Anya image yet, so I got out my brand new Peerless watercolors and had a lot of fun with her! I love these tiny pearls from Kaiser Craft - the second smallest ones fit *perfectly* into the circles in Anya's hair! I also added a little sparkle to her shells and tail that I really wish I could capture better. I used a Sakura Stardust glitter pen, and instead of drawing right on the image (which I felt was just a little too harsh), I scribbled it onto a piece of plastic then picked it up with my waterbrush and spread it out evenly where I wanted it. Lastly, I cut her out and popped her up on foam dots. The "For You" is from the Sentiments set. The only difference is that I used Excel to make up a spreadsheet (since I didn't want my messy handwriting all over these sheets). 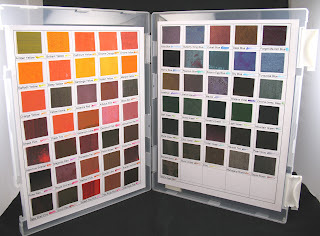 Then I stuck the finished palettes into a thin document holder that I bought from a local discount store to make them easy to put away when they're not in use (I wanted to make sure I don't accidentally touch the colors or spill something on them). Yes, it's a little big, but I have a lot of colors and I didn't want the color blocks to be so small I'd have to be replacing them constantly. And even though I only have a tiny little bit of clear space on my desk right now, I was still able to color with it just fine. Also, I just wanted to say that so far I'm really liking them. For the skin color, I did have to mix the color with water on a piece of plastic before I could use it (since it was way too dark), but all the other colors were just picked right off the papers with my waterbrush and then used to color as is. I found them very easy to work with and really like how they look. This doesn't mean that I don't still LOVE my Copics, just that I want options now that I love to color!! ETA: Mike won!! 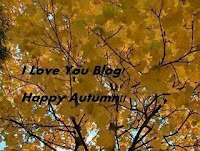 And you can check out all the entries on the Pink Poison blog. 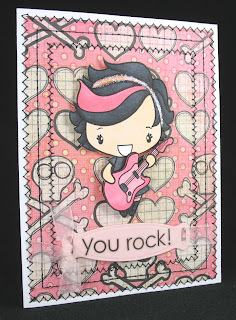 Marie issued a card making challenge on the Pink Poison blog for guys only and I convinced DH to do it! He took less time making this whole card than I usually do just pulling out supplies, and he totally blew me away with his creativity!! He chose the Best Mates set because he had an idea to do a hand-drawn treasure map in the background. Didn't it come out great?! I love the way he colored it (with my Copics, of course! ), especially her funky-cool hair!! Notice his attention to detail: the torn and inked edges for that aged treasure map look! He also did a neat card base which shows a big chunk of the back where he stamped the little ship and wrote his own sentiment. Awww - SO sweet!! Honey - thanks for making a card for me. 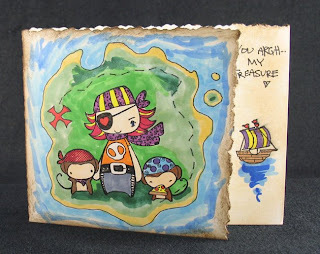 YOU argh my treasure!! Here's Part 3 of my series on altering Nesties shapes. If you missed Parts 1 and 2 please check them out! 1) Dig out your old Quickutz hand tool. 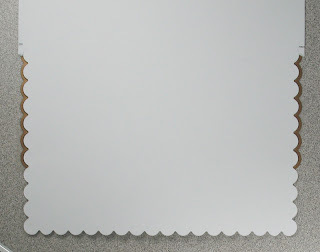 2) Cut your cardstock just slightly larger than you want your finished diecut to be (the hand tool has a very limited reach so you can't have too much excess cardstock). 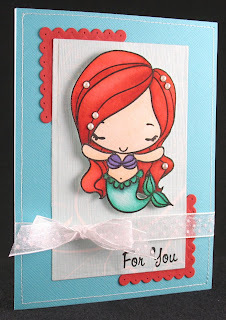 For this tutorial, I cut my cardstock 6.5" square. I'm using the same largest die in the Long Classic Scalloped Rectangles Large set. 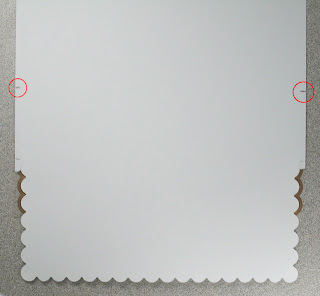 3) Position your die cutting edge down on your cardstock and secure with removable tape. 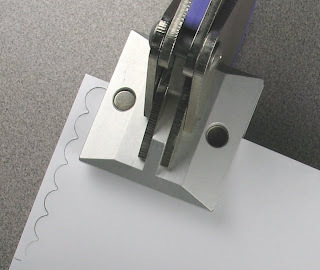 4) Flip your cardstock/die over and hold up to the light to see the die through the cardstock. Make 2 marks on the cardstock about 1 scallop in from the end. You must not cut past these marks. 5) Position the hand tool next to one of the marks you made in the last step. 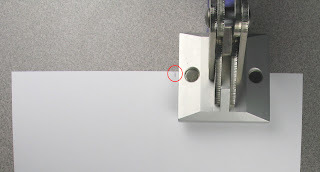 The magnets in the tool should help to keep the die in place. Squeeze to make your first cut. 6) Move the hand tool over and squeeze to cut again. 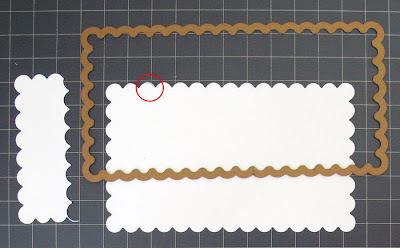 7) Keep moving and cutting, making sure you are cutting all the way through the cardstock as you go. 8) Stop cutting when you get to the second mark. Here's what you have so far after the excess is removed. 9) Just as in Part 2 of the tutorial, reposition the die so that only a couple scallops are in the die. Make 2 new marks to show you where to stop cutting. 10) Cut with the tool up to the new marks on both sides. I was only able to do about 1 cut on each side. Here's what you have after this round of cutting with the excess removed. 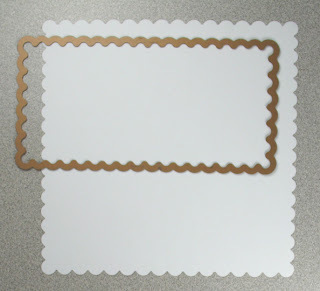 11) Continue moving the die and cutting until you get to the end of your cardstock. Position your die one last time and cut all the way around this final edge. Be careful that you don't cut too far. 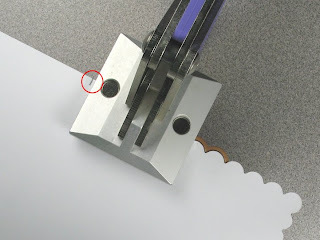 In the picture below, the circled area is the end of the die. If you cut there, you would ruin your diecut. Here's the final diecut - a giant scalloped square! 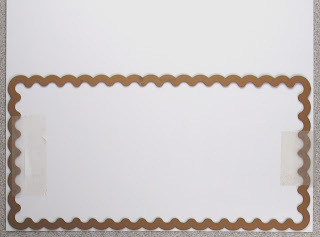 And just to take it a bit farther, I started with a rectangle of cardstock 6 1/2" x 11" for this beauty! And there you have it: A way to make ginormous diecuts with your Nesties. Hope you get some use out of this tutorial!! As promised, here is Part 2 of my tutorial. If you missed Part 1, you can check it out here. Also, I thought it might be important to know that I use the Big Shot. I've never used the Cuttlebug or Wizard machines, so I don't know if you can see what you're doing as well as with the Big Shot. 2) (This step is pretty difficult to see.) Re-align so that only a little bit of the previously cut piece is in the end of the die. For the scalloped dies, I tend to put about 2-3 scallops back into the die. You need to give yourself enough room to stop cutting so that you don't cut off the end you just made. 3) Now run through your machine, and just like the first cut, make sure you DON'T put the end with the excess cardstock through first. Crank the machine until it almost reaches the end of the die, but then stop and reverse so that the cardstock/die come back out the same way they went in. You should be able to see through the clear cutting plate if you've cut far enough. BUT.... at Lilian's request, I actually have figured out a way (just now!) 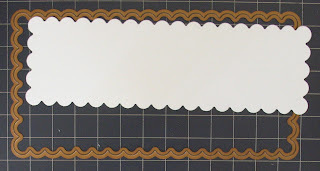 how to double (or even triple or more) the width of the longest scalloped rectangle!! It's a lot more work, but you're not limited at all in the size diecut you can make! Since this post is already really long and I have to do up the new tutorial, please join me tomorrow for Part 3! 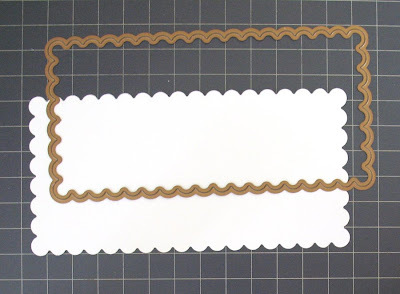 I've seen a few creations where people cut their Nestabilities die cuts and tape them back together to make them longer or shorter, so I decided to do a little picture tutorial on how I alter my Nesties shapes while still keeping them in one piece. This means no taping together and no joined line to worry about hiding! 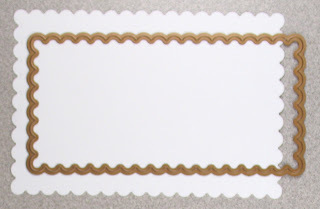 Yes, there are still limitations, but for the most part, I've found these techniques give me more than enough sizes for cardmaking. 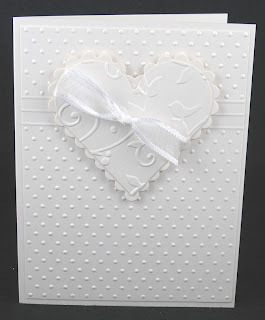 I used the largest die in the Long Classic Scalloped Rectangles Large set. It may be a little easier to understand if you click to enlarge the pictures. First I'll show you how to make a shape shorter (or skinnier) and then tomorrow I'll show you how to make a shape longer (or possibly fatter). 1) Cut your piece out as usual. 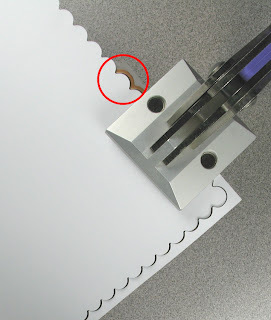 2) Place your die down, cutting edge up, then take the cut out piece and re-align the sides within the cutting edge of the die, leaving one end protruding out beyond the edge of the die. 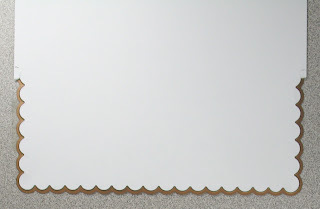 You can see below that for this example, I'll be cutting off 3 scallops from the left side. 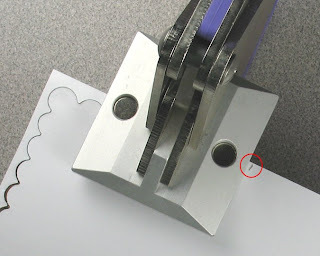 3) Run through your die cutting machine again being careful not to shift the die cut within the die. You can see from the picture below that a small portion of the die cut shifted when I ran it through the machine the second time. However, it's so small, you'll never notice! 4) This is the shorter die cut next to the die so you can see the difference in sizes, and also the little bit that was cut off. I've circled a tiny little sliver of extra paper that was left because of the shift. I just scratched it lightly with my fingertip and it came right off. Please join me tomorrow for Part 2 of this tutorial! 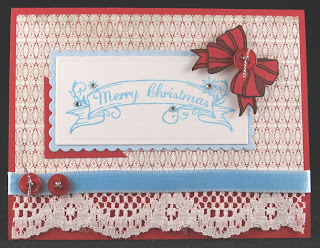 A little while ago, Marie at Pink Poison had a contest on her blog to make as many PP cards as we could. I really wanted to make a giant stack of cards, but life got in the way and not wanting to make slapped-together cards just to make a lot, I ended up with only 6. BUT, I'm really happy with how they all turned out, and that's what really matters to me! I wanted to share a couple I made with my new Anya images. I found this cute heart and skull paper from Sassafrass Lass in my stash in a kit I got forever ago and thought it was perfect to go with Rockstar Anya. I colored her with Copics (including an extra guitar with arms attached for dimension) and accented her hairband with some Stickles. Then I cut her out, added the extra guitar, and put a ton of foam dots all over the back. The letter stickers also came from that same kit (it makes me SO happy to use up old stuff!!). To finish her off, I just did a bunch of sewing with black thread to frame her. I've been wanting to use a Making Memories spiral journaling book for a while, but just couldn't find the right image to match until I got Teacher Anya. 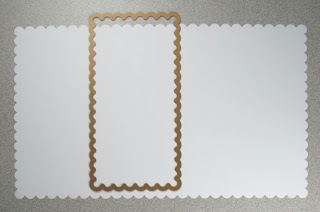 I traced the shape of the patterned paper onto my card base and cut it to match. Then I got the idea to just do black and cream with some red pops so I stamped her on cream cardstock and left her uncolored. I stamped an extra apple, colored with Copics and added some dimensional glaze, then stuck on with foam tape for dimension. She is also entirely cut out and stuck on with foam tape. The Hello stamp is from the Lucky Bunnies set. I finished the card off with some red buttons and red velvet rick-rack held on with staples to complete the school look. Thanks for looking and I hope you like them!! Today's card was made using the Little C's Weekly Challenge #16 sketch. I used Baby Beebo from the Doodle Factory, and speaking of DF, they just released an adorable holiday set called Santa's Sweet Shoppe as well as a set of matching sentiments, and they're giving away both on their blog! Go check it out and spread the word for a chance to win! Other materials used: sentiment - Papertrey Ink (Bitty Baby Blessings set); patterned paper (Nana's Nursery Baby Girl pad) - DCWV; ribbon - May Arts; word window punch and Creamy Caramel cardstock - Stampin' Up! ; scalloped square Nestabilities. Sorry it's been so long since my last post, but things have been totally crazy around here and I haven't had much time to play! Wedding cards aren't my favorite to make because I have a hard time coming up with really elegant ideas. So when I had to make one recently, I turned to Heart Prints for help. Not much to explain except I used 2 different Cuttlebug embossing folders, the hearts were cut with my Nestabilities, and I did the score lines on my Scor-Pal. Last, but certainly not least, I want to thank Enjoli for this sweet blog award and also for the kind words about my cards on her blog! I always love seeing works from other local gals and Enjoli's stuff rocks so please go check out her blog! !